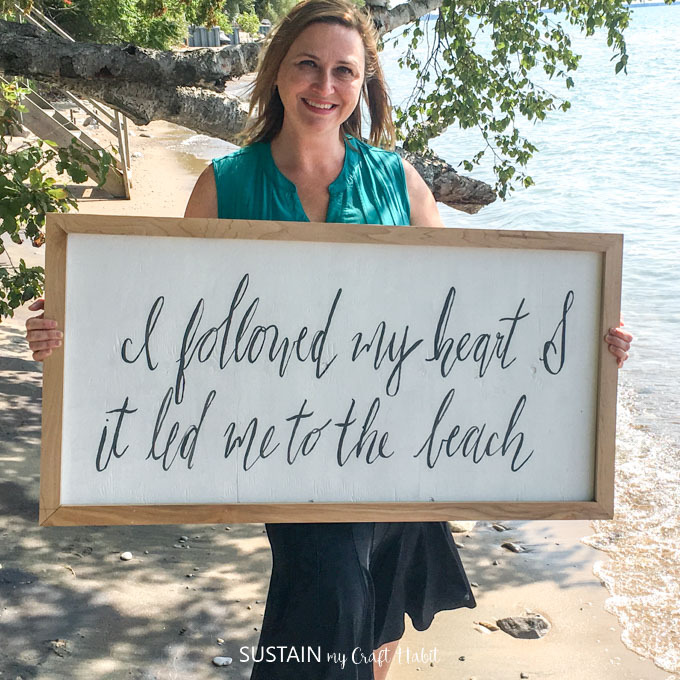 “I followed my heart and it led me to the beach”. 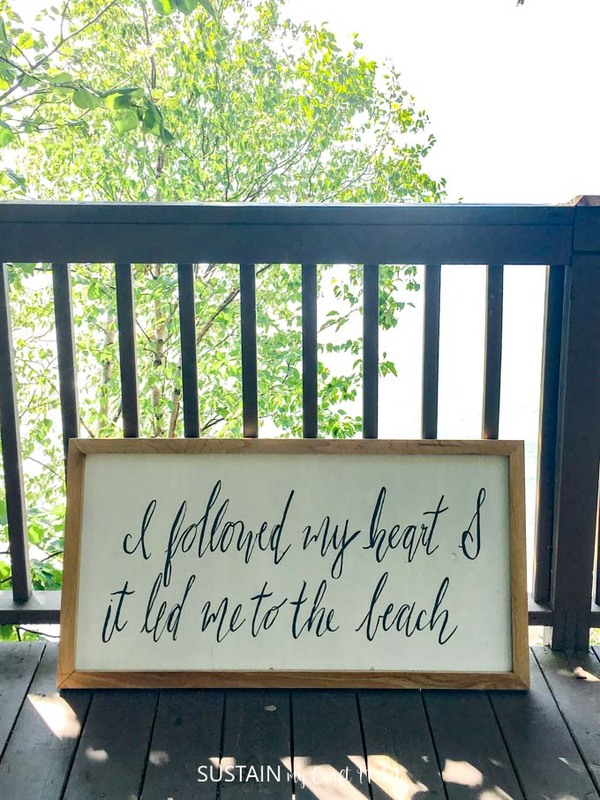 When I saw this phrase I knew it had to be a part of the farmhouse sign I was envisioning for the Lakeside bedroom of our Graystone Beach cottage. 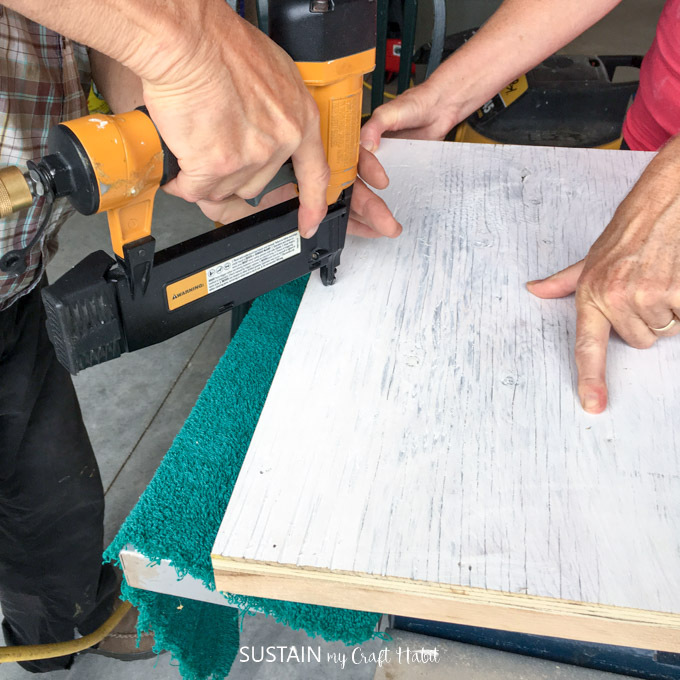 Keep reading to see how I made this beach house sign for free, using scrap wood we had on hand! In January of this year we started remodeling our 2-bedroom family cottage in southwestern Ontario. So far we’ve made-over one bedroom with a bunch of coastal decor ideas, given the only bathroom a beach-themed remodel and are now on the verge of finishing the second bedroom which we call the Lakeside room. (Update: Find the completed Lakeside beach bedroom makeover here!). 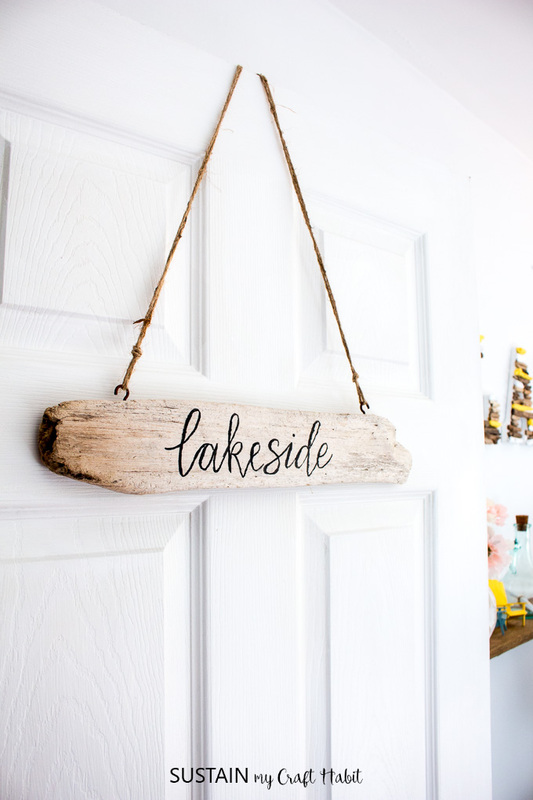 The final DIY in this room is this beach-themed farmhouse sign to go above the bed. 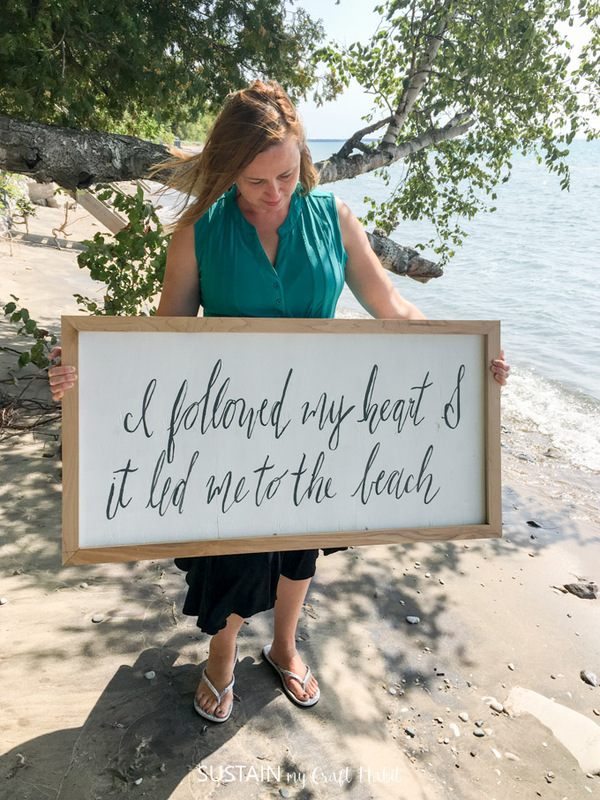 I’d fallen in love with hand-lettered farmhouse signs such as these by Linda of The Summery Umbrella on Etsy,* and had to try making my own! Although it’s not quite as nice as Linda’s pieces, it was free as I used scrap wood pieces from recent projects. When I look at it now, I feel like there should be … after “beach”. I may just add them on there still. 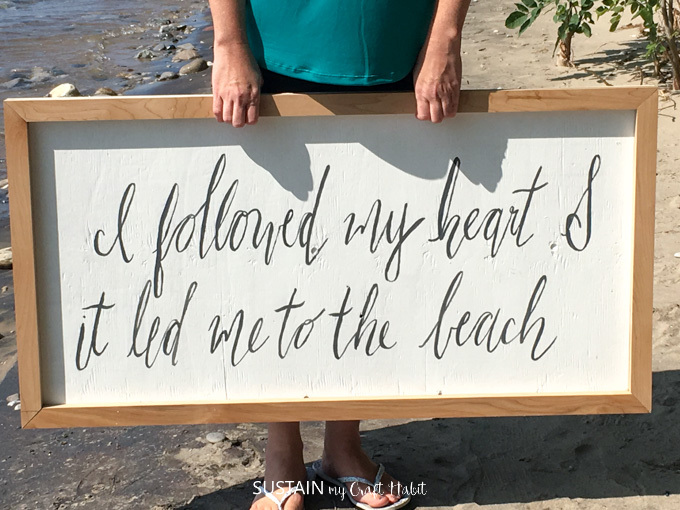 If you’re interested in more sign inspiration visit Gina over at the Shabby Creek Cottage blog who is hosting a challenge with over 100 DIY sign ideas! I started with a piece of scrap plywood measuring approximately 3”x4”. [Note that I cut it down a bit after completing the lettering as there seemed to be too much whitespace]. I sanded it using a palm sander to remove any splintered wood and make it smooth on both sides. Next, I sealer the surface with DecoArt Stain-Blocker to prevent the piece from yellowing. 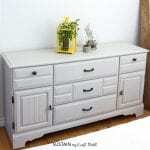 Once dried, I painted the plywood surfaces with DecoArt Americana Satin Enamels in white. 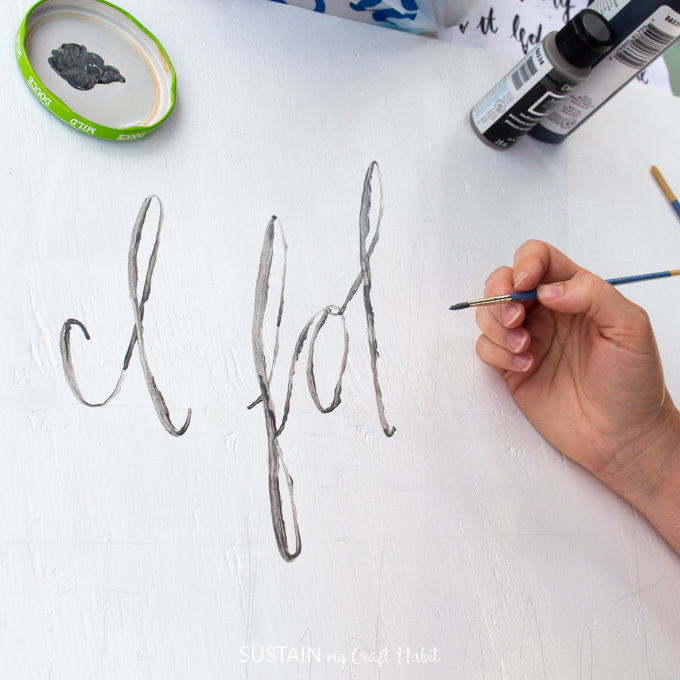 One of the best aspects of a farmhouse sign is the inspiring script, hand-lettered phrase on it. Although I wish I could freehand my lettering, I’m not quite there yet! 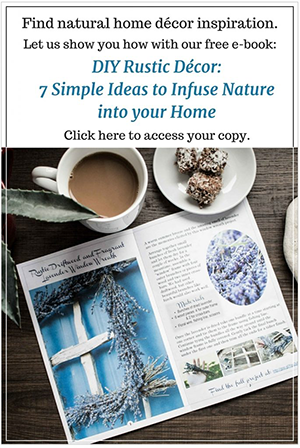 I’ve been taking this great online class by Colleen of the Lemon Thistle Blog, and am getting better, but still have work to do! My little hack is to start by sketching the lettering on a piece of paper until you’re happy with how it looks. You can even refer to fonts you like as reference. For example, there are lots of gorgeous script fonts on The Hungry JPEG and this one called Brostars is close to the look I was going for. 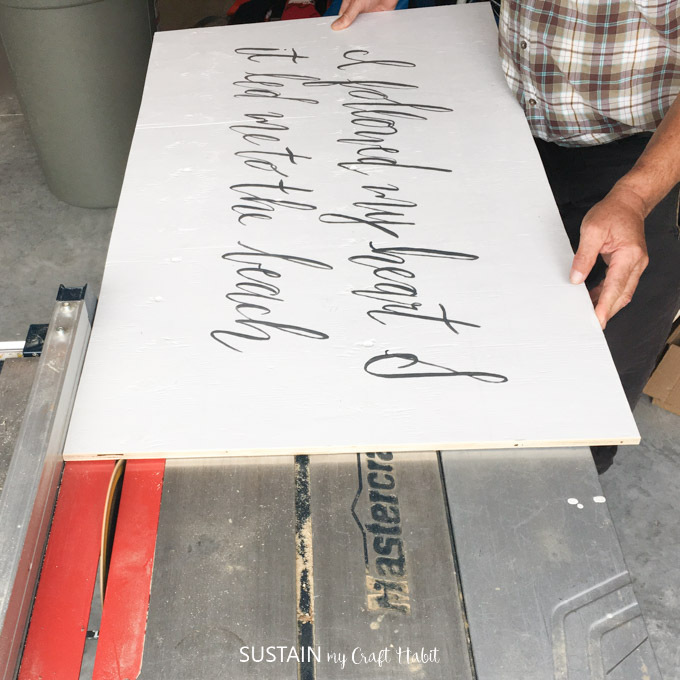 Once I was happy with my phrase and lettering on paper, I took it to my plywood canvas. 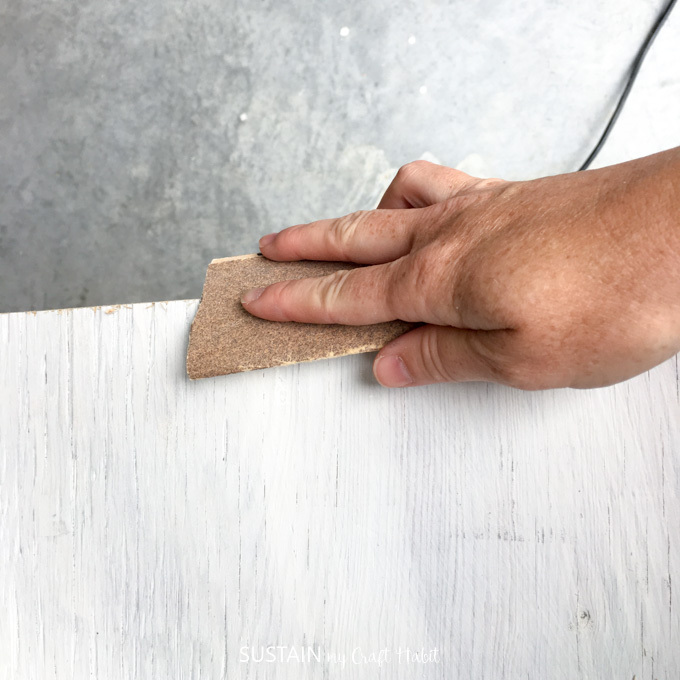 I started by drawing faint lines on the painted wood with a ruler and then used my paper version as reference to letter the phrase lightly with pencil. I actually had to erase it once to get it all centered. And once I was happy with the shapes of the letters and the spacing of the phrase on the sign, I traced over the pencil marks with dark gray paint. I have to say that the Multi-Surface Satin paint I used made my paintbrush “slip” quite a bit again the Satin white paint. However, it did the trick for the first pass. I let this paint dry completely and then went over the lettering a second time using Chalky Finish paint in Relic. This adhered better and gave the lettering a consistent, smooth look. Be sure to thicken the downstrokes on the lettering. And leave the hand lettering to dry fully before moving on to the next step. I toyed with the idea of distressing the sign at this point, but I decided to leave it. The clean finish will look quite nice in the crisp and fresh Lakeside bedroom. As I mentioned above, we went back and cut off some of the extra white space all around (our dad insisted on helping!). I sanded of any rough edges. 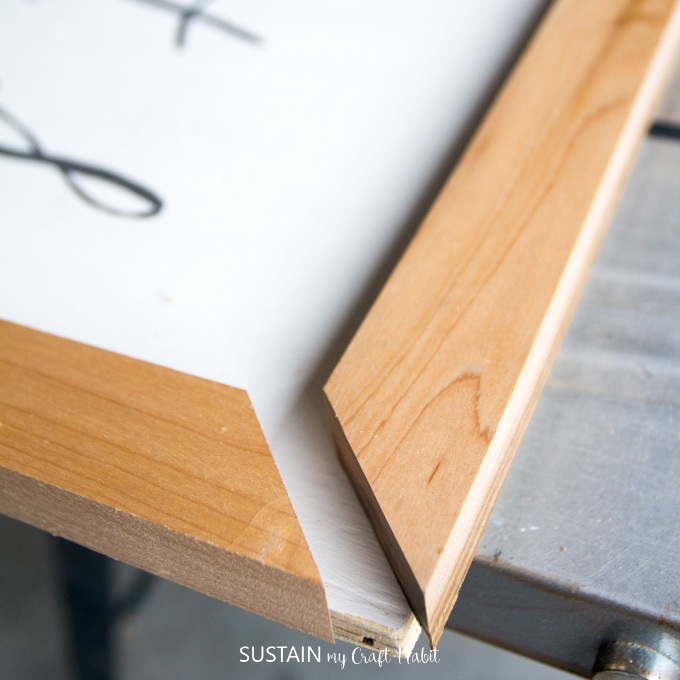 To construct the frame we cut down pieces of scrap hardwood flooring my parents picked up from their neighbours dumpster after a renovation. Yup, now you know where we get it from. The wood is beautiful though and perfect for this project. 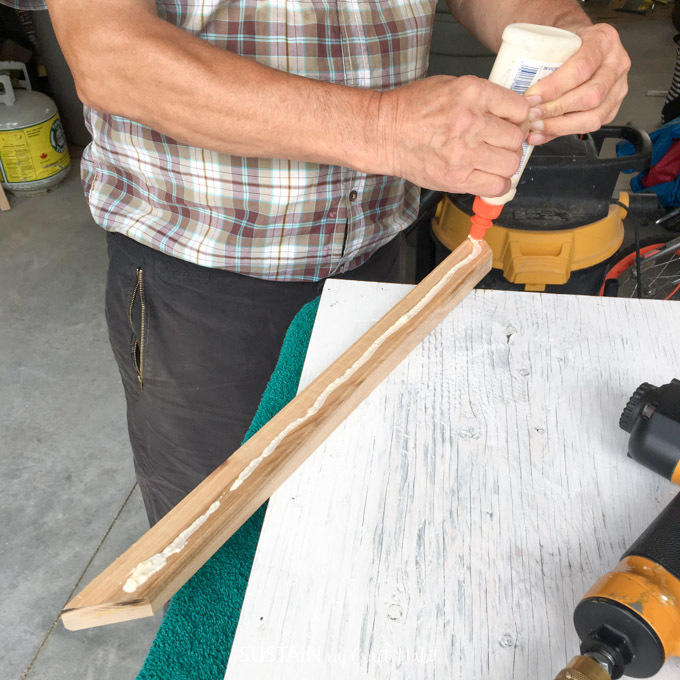 Dad cut the pieces to about 2″ thick and then cut the ends at 45 degree angles so that the corners would meet up nicely. And then nailed it to the front of the sign with an air gun nailer. He put a towel down underneath to make sure the frame wouldn’t get scratched by the pressure of the nail gun (clever guy!). We repeated this all the way around the sign. 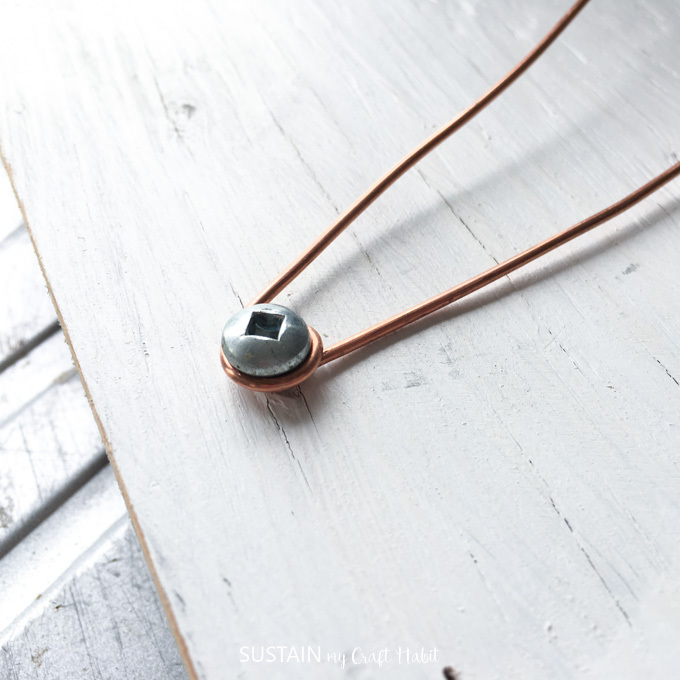 As for hanging hardware, we stripped scrap electrical cables and pulled out some of the copper wire. We simply wrapped this around a small round-head screw at either side of the sign, about 6″ down from the top. We snipped of the excess wire ends. And there she is! My little coastal-inspired farmhouse sign. I couldn’t resist bringing it down to the beach to take some photos with before we put it up in the Lakeside bedroom of the cottage. 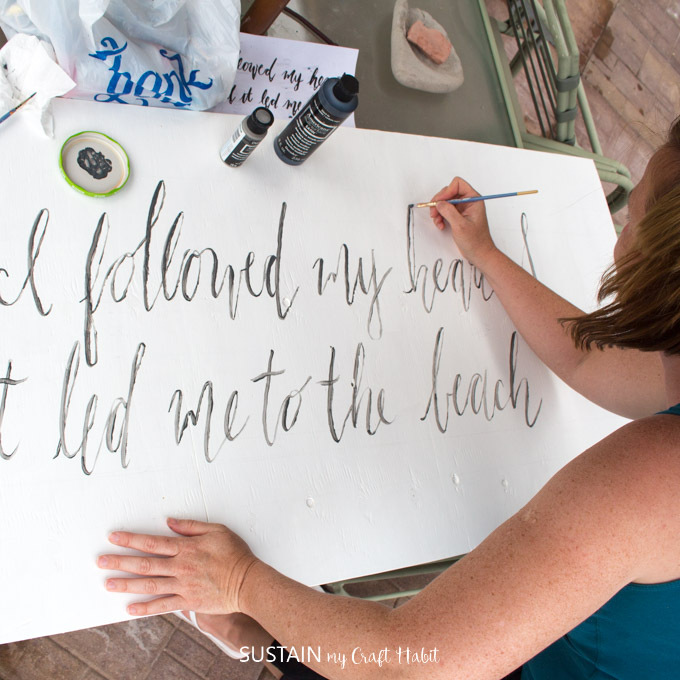 What phrase would you put on your DIY farmhouse sign? Wow!!! 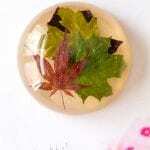 This is gorgeous!!! You make it look so easy too. Your sign looks so nice! I love how resourceful you were with materials. Love this! 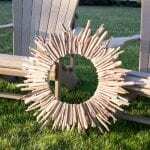 It looks so great, and the fact that it was free using scraps makes it even better! This looks beautiful and your lettering is amazing! 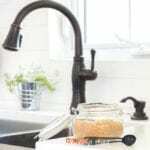 Perfect free DIY project! Such a beautiful sign! Love your hand lettering, wow! I love it! Your handwritting is gorgeous!